Rumor and terror in one immigrant community. It was a Thursday morning in Austin, and suddenly ICE was everywhere. A hotline for deportation-fearing immigrants — which typically got a call or two a day — started fielding a call a minute, overwhelming the volunteers manning the phones. The pleas were vivid: They just took away a member of my family. They just raided my neighbor’s house. They followed him and pulled him over at the side of the road. I saw them in a strip mall parking lot. I saw them down the street. There’s a black SUV, and I think that’s them. Nightmares were spreading among the city’s 100,000 unauthorized immigrants. Only a few of them were real. While much of President Donald Trump’s agenda has stalled, either in Congress or in the courts, his efforts to revamp immigration enforcement within the US — to deport more people more quickly than his predecessor Barack Obama or any other modern president — are moving forward. The fear of deportation is spreading faster still. In the beginning weeks and months of the Trump administration, whole immigrant communities have been smothered in panic. The simple act of going outside has turned unthinkably risky. Partly these fears are the product of (deliberately or otherwise) aggressive tactics on the part of federal immigration agents. But partly they’re the product of the worst nightmares of immigrants’ minds, now unleashed by the administration; perhaps unsupported by reality but not, in their existential fear, wholly irrational either. The most persistent specter, in many communities, has been the threat of law enforcement checkpoints: Immigrations and Customs Enforcement officers camped out at the side of the road at heavily trafficked intersections in Latino neighborhoods, forcing drivers who came through to stop and prove they were in the country legally — or be arrested, detained, possibly deported. Reports of such checkpoints flooded the hotline run by the advocacy group Grassroots Leadership that February Thursday in Austin (part of a nationwide sweep that picked up 683 immigrants over a few days). They also popped up in dozens of copied-and-pasted Facebook posts and retweeted tweets. There was a checkpoint at the intersection of Lamar and Rundberg. No, there was one on Decker Lane. No, it was somewhere else. Advocate Zenén Pérez, of the Texas Civil Rights Project, got into his car and drove around to the intersections where ICE was reportedly camped out. He didn’t find any checkpoints. Or any evidence that they existed to begin with. Similar checkpoints seem to be “spotted” almost every day now: in Queens; in Burbank, California; in Orlando; in Montgomery County, Maryland. None of them have ever been verified or legitimated. 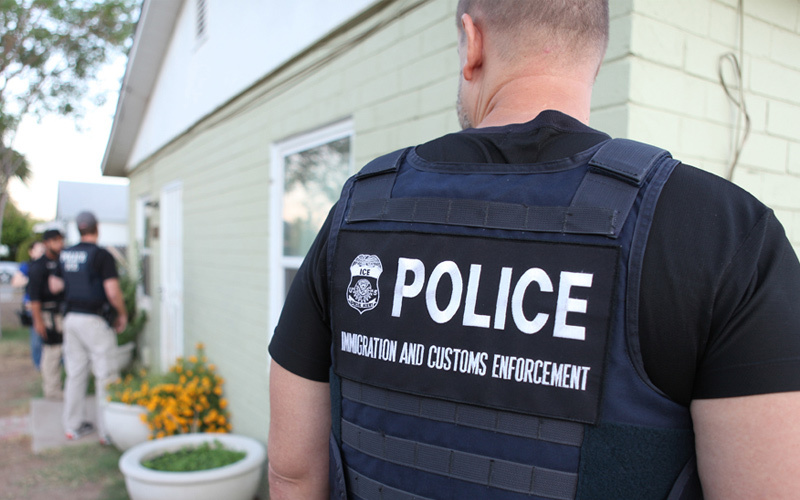 ICE strongly denies that it is conducting roadside checks of random drivers (and blames advocates for spreading “false, dangerous and irresponsible” reports). But immigrants remain convinced those checks are real. As a result, many immigrants have avoided public space entirely. In South Philadelphia, an annual Cinco de Mayo festival has been canceled for fear of ICE. In California, immigrants are pulling out of medical appointments en masse. Only now, several weeks later, is the community even beginning to show signs of recovery. And the slightest hint of a new raid could be enough to take it down again. Austin — like many other immigrant communities around the US — was primed for panic well before February. Immigrants’ fear started to escalate after Trump’s election in November. Education Austin, the union representing the city’s public school teachers, began training students and parents to prepare for ICE raids. Trump’s January inauguration provoked a new wave of worry — and set off a local fight that, in turn, gave immigrants (and the advocates who serve them) even more reason to dread a crackdown from the state and federal governments. The local sheriff, Sally Hernandez, announced the day of Trump’s inauguration that she was setting strict limits on ICE agents’ ability to pick up immigrants detained in local jails — moving the county, by some definitions, into the category of “sanctuary” jurisdictions. Texas’s state government has already taken aim at Austin over its liberal immigration policy, stripping it of some public safety funds. The Trump administration had made it clear that it didn’t tolerate “sanctuary cities” either. It was easy to imagine that ICE might follow the state government in cracking down on the city. Ultimately, it turns out, there might be something to that theory: A Texas judge testified in March that ICE officials told him, two weeks before the raids, that they’d be conducting an operation in Austin as “the result of the sheriff’s new policy.” (ICE officials have denied the judge’s claim, but some anonymous employees at the agency have confirmed to reporters that they are trying to target “sanctuary” jurisdictions.) But at the time, the sense of inevitable retaliation led advocates to start seeing the specter of a raid before any raid actually happened. On February 2, immigration lawyers and advocates started raising alarms about heightened ICE presence and activity in Austin. The resulting “ICE Raid in Austin?” headlines fueled a weekend’s worth of rumors about checkpoints and raids. “That turned out not to be true,” says Cristina Parker, immigration programs director for Grassroots Leadership. But “everyone was a little bit on alert” nonetheless. Then on Thursday, people started calling the hotline with “their direct experience of knowing somebody who was taken,” Parker says. Austin had seen raids before. In 2005 and 2006, as President George W. Bush began to ramp up federal immigration enforcement, ICE agents swept through Austin neighborhoods; in January 2016, the Obama administration used raids to track down Central American families who hadn’t shown up for their asylum hearings. This time, there was radio silence. Even after reports of immigrants getting arrested began to be confirmed, ICE said everything was “routine.” The Mexican consulate (which did appear to be in communication with federal officials) tried to fill the gap; Pérez called that consulate “the best partner that we have right now, in complete information.” But advocates didn’t know enough — or didn’t have the reach — to address the wave of questions, rumors, and fears that swamped the city over the next few days. Advocates were concerned that community members were mistaking local police officers — or state law enforcement officials, who were (in a stroke of very bad timing) going around arresting people on old warrants for unpaid parking tickets as part of the annual “Great Texas Warrant Roundup” — for ICE agents. Or they worried that a picture taken of a single arrest was being shared hours, or days, later as evidence of a permanent checkpoint. Pérez and his colleagues urged community members to timestamp everything. “It’s kind of like a cycle,” Pérez says. Every raid triggers a panic effect disproportionate to its impact; the fear triggered by the January 2016 raids was nothing compared with the current panic, but it still threw a shadow over some people who (if they’d known the facts) would have known they weren’t at risk of being caught up at all. But in the fog of rumor, the distinction got lost. That’s largely because ICE’s arrests may have been targeted, but they were also extremely public and visible. It was hardly a wild extrapolation. Austin is barely outside the zone, stretching 100 miles into the US from the southern border, where Customs and Border Protection agents can set up permanent checkpoints to apprehend unauthorized immigrants. And while ICE agents can’t set up roadside checkpoints themselves solely for the purpose of checking drivers’ immigration status, according to Chris Rickerd of the American Civil Liberties Union, they have been known to “piggyback” on checkpoints for other purposes set up by local police. In a single morning in 2012, a checkpoint set up by the Jackson County, North Carolina, sheriff’s office — ostensibly to check if drivers were wearing their seat belts — allowed the ICE officers conveniently stationed at the checkpoint to arrest and detain 15 immigrants. Austin’s immigrants don’t know everything ICE can and can’t do under the law. They only know what they can see. And what they saw in February, according to local businesswoman Velia Cervantes (who runs a flea market toy shop), were ICE agents in immigrants’ public spaces. “Where the trucks are, where the businesses are,” she says, ICE was there. From an agent’s perspective, though, the raids may be trying to avoid sowing undue fear. Theresa Cardinal Brown, who worked in the Department of Homeland Security under George W. Bush and is now at the Bipartisan Policy Center, says the alternative to arresting someone in public is usually arresting them at home — which causes its own problems. For several days after the raids, many immigrants were afraid to go out in public at all. Parker said construction worksites that were “usually extremely busy, with a lot of people out there working, seem very dead lately.” At least one local restaurant had stopped opening for lunch because its workers wouldn’t show. And according to anecdotes from teachers, at least (the city school district hasn’t released official attendance statistics), public school attendance was way down in the days after the raids. “Today I was talking with one of the parents that I’ve known for a really long time,” Montserrat Garibay, vice president for certified employees of Education Austin, told me a week after the raids, “and she was sharing with me that two of her really good friends are very worried.” One parent, Garibay’s friend said, was so depressed and anxious that she had locked herself in her apartment. “The kids and her, they’re just in the apartment, not going out anywhere. Because they’re kind of in a terrified state,” Garibay says. La Pulguita de North Lamar is the sort of indoor flea market that sells basically everything, from subwoofers to frilly First Communion dresses. On a rainy Saturday in March, most of the merchandise is going unsold. The market isn’t empty. Young men hang out in the seating area near the taco stands; a young girl presses her nose against a display window in admiration of the blue quinceañera-style dress on the other side. But customers aren’t willing to talk to me. The empty avenues toward the front of the market testify to how many would-be customers were still unwilling to come out at all. How many are no more willing to go shopping on a Saturday than they are to show up at a domestic violence shelter or seek public benefits? How many still believe that not just government institutions but public space itself is toxic to them? How many are still haunted by the fear of the phantom checkpoints? The knickknack saleswoman says she’s made only one or two sales on the day so far — and of only a few dollars apiece. Cervantes gestures to an empty kiosk; vendors have to pay rent on their spaces every week, and vendors who didn’t have the cash reserves to weather a few weeks of low or no sales got wiped out. Cervantes herself is all right so far — her toy stall tends to make its money in the months leading up to Christmas — but she’s worried about what will happen toward the end of this year. “Some people get all the family” and take them back to Mexico, she says; will there be enough customers left in Austin and interested in buying toys for their kids? The woman in the knickknack stall (who declined to be named due to privacy concerns) sighs when asked why she came to work in an empty market in the weeks after the raids: “Someone has to be here to pay the rent,” she shrugs. Negar pasaportes, ¿Un preludio de algo peor?